Hunting dogs have been helping man gather food since time immemorial. Man may have been the original ‘hunter-gatherer’ – but without dogs to scent out and bring home the fruits of his efforts, our abilities to feed ourselves, and indeed our whole evolution, could well have been very different. As a result of this interdependence, a variety of breeds have been taught the skills needed to pursue, catch and retrieve prey. And as man has ventured ever further afield in pursuit of such prey – although mainly, of course, these days, it’s done for sport – he has needed to transport his dogs with him. 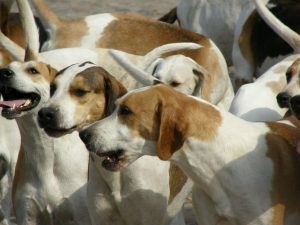 But the biggest issue involved in the safe transportation of hunting dogs is that these are, by nature, highly energetic animals, with a requirement for plenty of space for stretching out to make themselves comfortable and save energy on their outward trip, and for relaxing and recharging on the return. This is summed up admirably by Mark Romanack in an article written for Wildfowl magazine. Yet most, if not all, of these need to be kept easily accessible. Because hunting dogs are highly social animals, they are often happy being together in all circumstances – including when they’re traveling. So it’s little wonder that many keen hunters invest in some appropriately large vehicles to use as their main transportation. And this all adds to the serious cost of pursuing their hobby. Romanack is one of a few lucky hunters who have found the funds and have had both the time and the D.I.Y. know-how to enable them to adapt the cargo areas of their vehicles by adding purpose-built dog pen holding areas, which can hold a couple of pens big enough to carry his Labradors, as well as having room for his guns and clothing – including waders. But if you don’t have the luxury of your own pick-up or large S.U.V., it doesn’t necessarily mean that you can’t take up hunting. After all, going down the same path as Romanack is going to be an expensive affair. So have you thought that you could eliminate the need for a stack of that extra space, by calling on a dedicated pet transportation service to make sure that your dogs travel in comfort, and are well cared for? That way, without the heavy initial outlay, you can still hire someone who already has the vehicle, the pens and all the extra bits and pieces needed to be sure that your canine companions travel first class. Sporting dogs such as this cocker spaniel are often happy travellers – because they associate a car journey with ‘going to work’. Because they do the job at least in part to earn a living, their vehicles are often permanently fitted out with good quality pet pens, which may be permanently fixed in place using good quality fixings. They will invest money on a good quality crate, along with the proper equipment to be sure that is stays where it should go. And if you’re skeptical about the benefits of using a crate, or doubt whether your dog will take to the idea of being confined in one, then some of the comments from forum contributors should convince you. But the crates are just part of the standard gear typically carried by shippers who find work through Citizenshipper. Of course, among the most important supplies they will be sure to carry is plenty of fresh water. But here’s a tip many follow – when transporting a dog, it’s wise to fill your container from the same supply as they regularly drink from. And certainly be wary of where you let a dog drink from while you’re on the road. Streams, lakes and other public water sources could have all kinds of nasties lurking in them! Plastic storage containers – like you’d use for storing rice and pasta – can also be used to keep dry dog food just that, so that it’s fresh and stays crunchy whenever a dog is ready to eat it, so they’re an essential for any animal that needs to top up their energy levels while on the move. The most important item a professional dog transporter will carry is probably, though, not theirs. It will be the regular bed used by the animal they’re transporting. They’ll have enough room for, and will be totally cool with, their pet passengers having their own, familiar beds and bedding with them – ideally along with a selection of toys for them to chew on to keep their minds busy on the long, boring stretches. And even the most focused sporting dogs like to switch off from time to time by gnawing on a well-loved dog toy! Because of the physical exertion they subject themselves to while hunting and chasing, sporting dogs fall prey to injuries far more than their domestic cousins. So they will be grateful for the doggy first aid kits which many pro transporters carry with them. One of the main constituents of such a kit will be a proprietary treatment for ear infections, which are often contracted through contact with water. Most will make up their kits from other treatments which they’ll use on their own pets, as well as a selection of the most popular medicines for treating common ailments. Plenty dogs love a trip in the back of a pick-up – but this is a definite no-no if you want to transport them safely to where they need to go to work. Sporting dogs are likely to be more used than many purely domestic pets to be comfortable with regular travelling. But that isn’t to say that there aren’t incidents of dogs dashing out into traffic during a rest stop. That’s why lots of drivers will keep a choke chain to hand, for slipping over the dog’s head, so that they can keep them under control when they might get freaked out by unfamiliar surroundings. Also, a working or hunting dog poking its nose into another dog’s territory is a recipe for trouble – so keeping it well leashed when it’s mixing with others is a wise move. 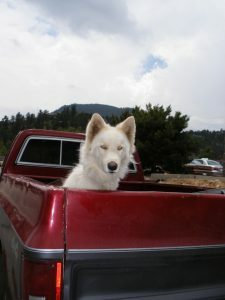 If you want to keep your dogs away from others, and minimize the risk of confrontations, a specialized trailer is another option some owners use. But here again, there are serious drawbacks, including that you have to expect them to not ride as smoothly as your car – and when you’re heading across some rough terrain to get to your shoot site, that’s far from ideal. On the other hand, when you hire a pro pet transporter, they’ll have the set-up to make sure that the dogs are not just safe, but comfortable too. 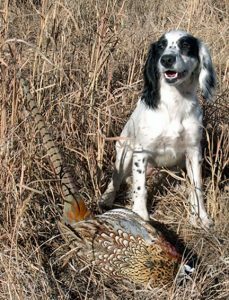 So get your ‘ducks in a row’ ahead of time, and take some of the stress out of planning your next hunt trip, by looking into the possibilities offered by using dedicated pet transportation services. Citizenshipper.com makes it all simple – just post the details of when you want your dogs moved, and your collection and drop-off locations. The certified drivers signed up to use our service can then bid for your work, and you communicate directly with them to make all the necessary arrangements, ensuring that your required timescale is met. Fill out our simple form here, and you can soon start receiving bids and communication from those interested. And meanwhile, check out their reviews, to help you decide which drivers you can trust with moving your sporting animals. This entry was posted in Pets and tagged hunting dogs. Bookmark the permalink.